Solar panels have a life expectancy of 25 years and more, so it was a surprise to one business when their solar system failed in just two. The coating of their cheap solar panels had disintegrated and a fire was caused, resulting in thousands of pounds in repair costs. On top of this, the panels were offline for a further two years. This issue is the complete opposite of what solar panels are intended for. They’re designed to save you money on those expensive energy bills and as these prices are increasing year-on-year, it’s a welcome relief to produce your own power. So this report from the NY Times highlights how important it is to avoid cheap solar panels. You may think this incident is a one off, but that’s simply not the case. There have been worldwide problems with cheap solar panels and experts in the industry fear a crisis if people continue to invest in the budget systems. Dissigno solar developer’s Chief Executive, Dave Williams, has witnessed a number of faults with the cheaper solar panels. So the question you’re likely to be asking is, how do I ensure getting quality solar panels which will perform optimally for 25 years and more? Fortunately in the UK there’s a scheme which ensures the excellence of solar panel installations. This is known as the Microgeneration Certification Scheme (MCS) and is vital if you wish to receive the guaranteed feed-in tariff income. The MCS scheme regulates the industry and governs installers to ensure only quality products are used. Solar panel companies who are MCS registered, are also likely to offer a lengthy guarantee to protect your installation too. In many cases this guarantee can be as long as 10 years. What’s important though is not to be put off by companies offering cheaper prices in order to be competitive in the market. As always, the same product could be cheaper in one place than somewhere else, making it crucial to compare quotes between a number of companies. Which? 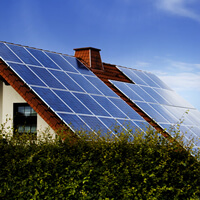 recommend receiving up to four quotes for home improvements, so take this advice and make sure you’re getting the best price possible for your MCS approved solar panels.